This post makes me sad. I love the idea of locally sourced food. I love the Wendell Berry idea of locally produced food creating healthy societies full of meaningful employment and healthy citizens. True believers imply that corporate food production is more likely to be unfriendly to the consumer, that the small farmer is somehow going to be more ethical and treat the customer better. After all, even though locally produced food may cost more, as neighbors we expect the local farmer to care about us in a way that corporations do not. Let me digress. The picture is a mystery plant. What it is not, is watercress, although it was sold to me as watercress at the local farmers market. 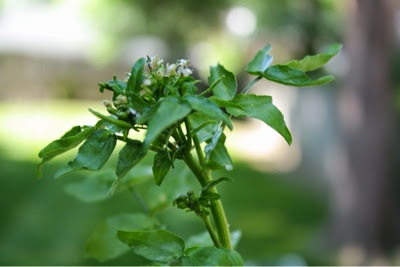 I placed pictures of this plant on Twitter and Facebook and Plantifier, an app that crowd sources plant identification, but no one recognized it, although everyone agreed that it's definitely not watercress. I ate a small amount of it, and my stomach did get upset, but I'm notoriously suggestible. I believe it's a type of field cress, what we used to call cressie in North Carolina, not generally considered edible, but I'm not sure. The same young man who sold me the faux watercress neglected to make sure I took the oregano plant I bought. I've had cashiers chase me out of Costco, Kroger and Publix to make sure I had all my purchases. I was moseying slowly around the farmer's market, which was small and almost empty, so it would have been very easy to take a few steps and hand me the plant I had forgotten. He had 4 to sell, so I'm fairly sure he realized I hadn't taken it. Last year, another farmer short changed me twice in the same way (acting like a $20 was a $10) on two different Saturdays. Bottom line, farmer's markets are Buyer's Beware and more like shopping on Craigslist than shopping at the local supermarket. No one is checking that what is sold is what is claimed. No one is going to make sure that you have correct change or that you have all of your purchases. No one, but you, will be penalized if you are cheated. The idea that a small farmer is more ethical than a large corporation is appealing but just not true. People are the same everywhere, and corporations have many checks to make sure their employees deliver correct change and have few opportunities for malfeasance. I need to be less idealistic and more aware and remember the many types of regulation that are not happening at the local farmers market. In the future, I will be focusing on finding farmers I trust and buying only from them. The phrase "know your local farmer" has a new meaning for me. Will keep trying to support them, but - couldn't agree more. Also has been a bit embarrasing to watch the farmer's market crowd in West Nashvile split apart and establish competing scenarios some twenty blocks apart.